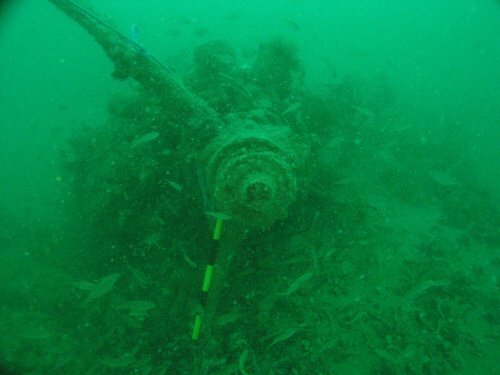 Marine aggregate dredging off the English coast has recently led to the discovery of a series of aircraft remains. Some of these discoveries are of dispersed wreckage but others are of aircraft that are at least partially intact. Aircraft found recently have included a Fleet Air Arm Supermarine Attacker and a WWII German bomber, a Junkers JU-88. Archaeological discoveries of this type are a sensitive issue. Such sites are protected under the Protection of Military Remains Act 1986 and where a crash site can be identified they are protected by â€˜Exclusion Zonesâ€™. This is important as often crash sites are associated with the death of the aircrew and human remains may be present. Unexploded munitions can also pose a hazard. The use of â€˜Exclusion Zonesâ€™ stops dredging in the vicinity and allows the importance and sensitivity of discoveries to be assessed. However protecting crash sites in this way can have serious consequences for the dredging industry, as it can put large areas of the seabed that are otherwise suitable for dredging out of bounds. The seabed off the south and east coasts of England contains one of the highest concentrations of crashed aircraft in the world. It is particularly rich in military aircraft, as a result of the pivotal role that air power played in the Second World War. For example, we know that 935 aircraft were lost off the Sussex coast alone between 1939 and 1945. However we know where only a few of these crashed aircraft are and it can be difficult to identify crash sites when they are found. Military aircraft crash sites receive automatic legal protection. However unless we know that they are there, this protection is of little practical use. It is not just military aircraft that have been lost at sea. Civilian aircraft such as an Imperial Airways Handley Page biplane lost in the English Channel in 1926 have also come to grief. Aircraft crash sites on the seabed are therefore likely to be representative of the entire history of aviation. Crashed aircraft on the seabed are not just of historic importance. For example, they can also provide interesting but fragile places for recreational divers to visit, particularly if they are relatively intact, and they can be rich in marine life. Aircraft crash sites on the seabed are a potentially valuable part of the historic environment around us. They therefore represent important and exciting challenges for the marine aggregate industry, the archaeologists who advise them and the archaeologists advising the industry regulators. As a result English Heritage has commissioned a scoping study to identify gaps in our knowledge and understanding of aircraft crash sites at sea. The results of this study will enable this rich archaeological and historical resource to be managed more effectively, reducing the adverse impact of dredging on the sites and vice versa. The study is being carried out by specialists in Wessex Archaeologyâ€˜s Coastal and Marine Section and is being funded through the Aggregate Levy Sustainability Fund. You can find out more about some of the aircraft remains that have already been discovered on the ‘Recovered from the Sea’ pages. If you want to learn about the detailed objectives that English Heritage have set Wessex Archaeology go to the ‘Project Objectives’ page.